Finally, after "months" of anticipation, a date for Audio 88's pow wow was set... on Christmas Day?! The gang met up at Choa Chu Kang MRT at 1100hrs in the morning (much too early for nocturnal people like me.. grinz) After having lunch at the nearby hawker centre - a treat from our first host, James, we proceeded to our first pow "WOW". Here's his setup: old Sony X-77(7ESD?) 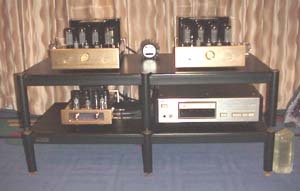 cd player, Audio Space preamp Line 3 and power amp model 9MKII, and Focus Audio 68s speakers on Foundation stands. 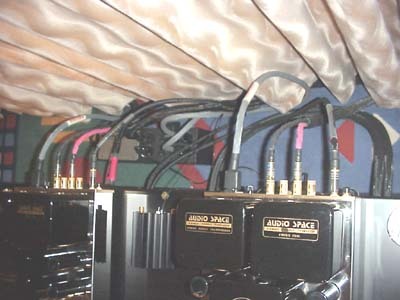 A look at his cables (most if not all) are Live cables. The Focus Audio FS-68 on Foundation stand. Rock solid speaker on rock solid stand. But potential was not fully realised (probably due to WAF ; ) ... 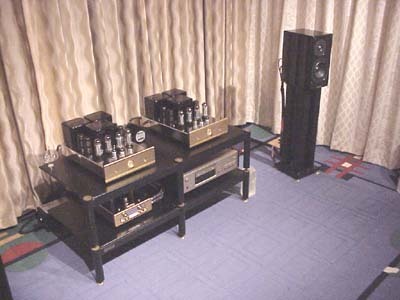 The stands are standing on circular protectors, which are resting on soft carpet. As a result, the entire structure was not rigid enough. Spikes from the stands should actually pierce through the carpet to rest on the floor. If not, a large granite/marble slab should have been placed on top of the carpet, with the speaker spiked directly on it. 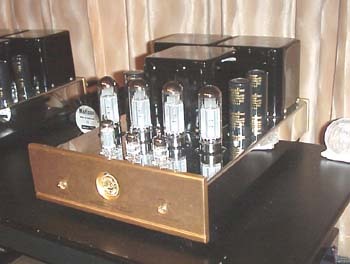 A close-up of the Audio Space power amp model 9mkII. I can already see Elna Cerafine caps being used, a good sign that quality components are being used.